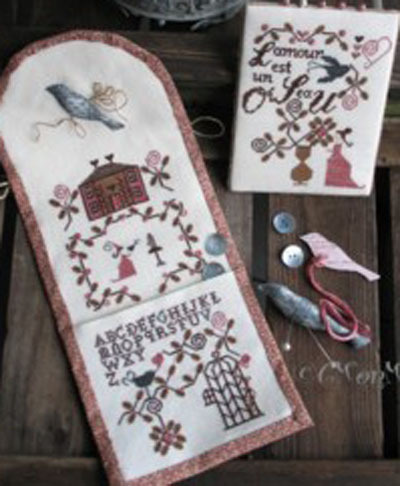 Translated title: "Lady Bird", a cross stitch design by C Mon Monde which includes many embroidery stitches. "Lady Bird" is a cross-stitch & embroidery chart with instructions translated in English. It comprises 3 patterns + finishing instructions. Please note that the bird above the house isn't part of the cross-stitch design (it is not on the grid). The text says in French "Love is a bird". Special stitches: This is mainly a cross-stitch design with quite a lot of embroidery: Rhodes stitch, daisy stitch, spider web stitch, eyelet stitch, Smyrna cross-stitch, French knots, straight stitch, feather stitch and tambour stitch. There are clear diagrams and instructions on the chart and you can choose to replace these stitches by regular cross-stitches but the result won't be the same. The model on the picture has been stitched on a 36 count linen fabric (colour "off-white") using two strands of cotton over two threads of linen. Recommended Fabric: linen or evenweave fabric, stitch count of your choice, colour "off-white" or "Ecru"
This product is a cross-stitch chart (3 patterns) + finishing instructions translated in English.